This Welcome Door Wall Plaque is ideal for the entrance into your home. 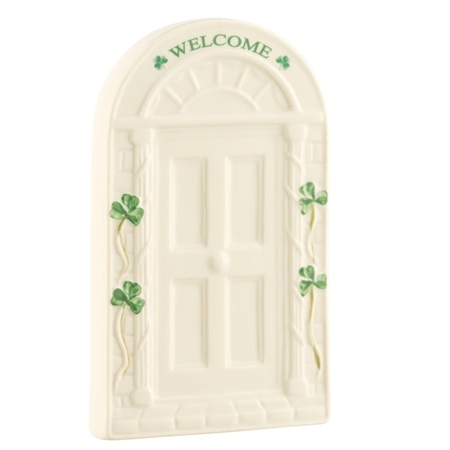 Filled with Irish heritage, hand painted shamrocks and a "Welcome" message, this will greet visitors as they walk into your home and it is sure to put a smile on thier face. Everything that comes from this company is very high quality. I will continue to order. This gift was received with admiration. Thank you for making such a beautiful decoration. I love Belleek. This made a perfect gift. Thank you Belleek. Is this door plaque weather resistant? Will weathering cause the paint to eventually wear off?